You can modify all of your tax information in the Taxes & Currency section of your account settings. Below is an overview of what this screen looks like. This is where you choose your account currency symbol, the first month and day of your tax year and your tax payment period. If your currency symbol isn’t available, send us a message through the Support option in the top right of your account and we’ll get it added. 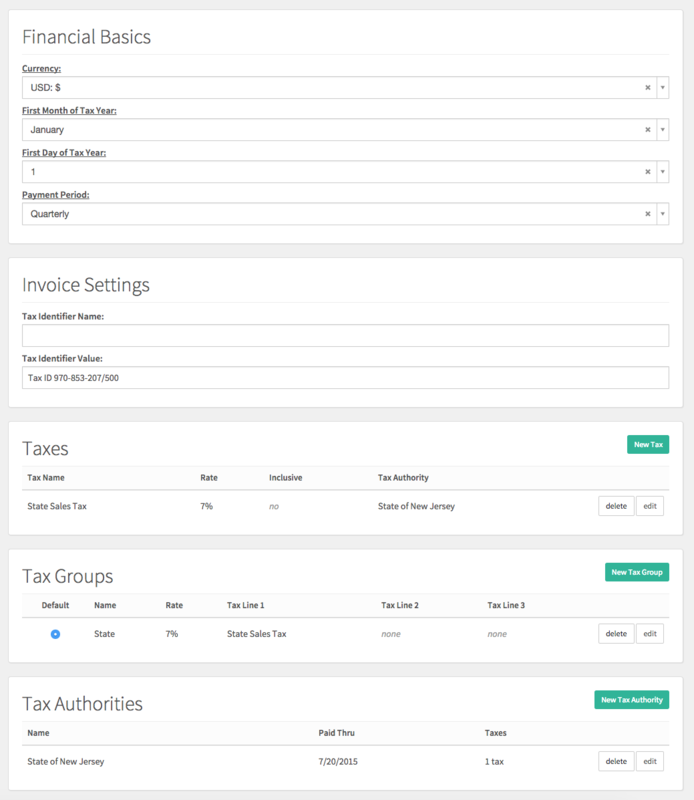 This is an optional area where you can specify your business tax identifier name and value, if it is something required in your location, or if you would like this information to appear on your client invoices. In this section, you enter your various tax rates you’re subject to paying in your area. You can make these taxes inclusive or exclusive. If inclusive, the prices you charge will include the taxes within their set total, and the tax portion will show up in your reporting when you go to pay your taxes using your Sales Tax Liability Report. Exclusive tax rates will add the tax that applies on top of the total of the taxed items on your client's order. This is the most common tax method used. Tax groups are what you’ll assign to your orders. They can contain up to three separate tax rates. You must have at least one tax group with a tax rate specified. Your tax authorities are who you are reporting to when you pay your sales taxes. After entering one or more authority here, you can set up your tax rates above to report to the appropriate tax authority. If your sales tax rate changes, instead of changing the existing tax to the new rate, you'll want to create a new one, and a new tax group to go along with it. You'll then make the new tax group your new account default group so that you can apply that to your new orders that are subject to the new rate. This way, it won't affect your existing past orders that are subject to the old tax rate.